While there is a lot to pay attention to in the markets in the short term, is there a longer-term story in gold that we should be watching? The CEO of Goldcorp (NYSE: GG), Charles Jeannes, recently put forth a case for peak gold. He argued that miners are not discovering as much of the yellow metal as in the past. This would, of course, lead to falling supplies of gold in the future and therefore a higher gold price. We hear talk about peak oil (although not as much these days), but we rarely hear about the idea of peak gold. 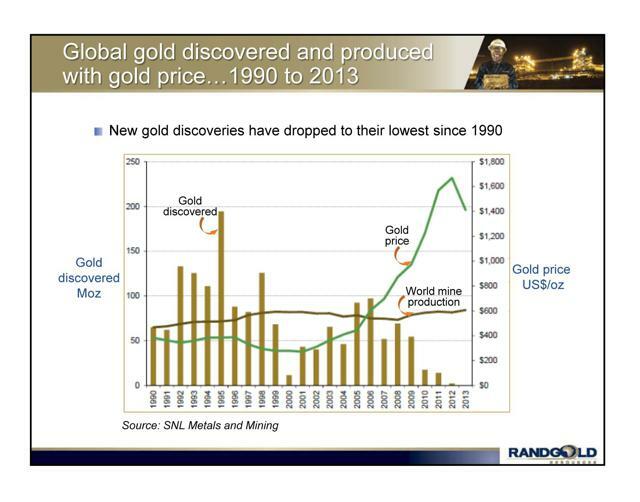 A chart released by Randgold Resources (NASDAQ: GOLD) shows that while world mine production has been steady over the last couple of decades, new gold discoveries have plunged in recent years. It's interesting that there is not greater production and more gold discoveries, especially considering the bull market in gold from 2001 to 2012. Economists say the best solution for high prices is high prices. This just means higher prices lead to greater supplies and less demand. But in the case of gold pulling back over the last couple of years, it's more a case of less demand. It's not because of a significantly increasing supply or even the anticipation of it. The prices of oil and gold have tended to be some what correlated over time. The correlation isn’t as much as with gold and silver, but there is definitely a history of oil and gold moving in tandem. This hasn’t been the case over the last several months. Oil prices have been plummeting, while gold prices have remained fairly steady. The reason gold and oil have tended to move together is because they are both commodities and highly sensitive to monetary policy. We talk about the supply and demand for commodities and other goods, but we also have to consider the supply and demand for money. When there is a significantly increasing supply of money or a decreasing demand for money, commodities will tend to go up in price. If the demand for money is increasing or the supply of money is decreasing (or only increasing slightly), then commodities tend to go down in price. We can certainly believe that monetary policy has played some kind of a role in the fall of oil prices. It was easy money that helped push the price up, so it is not surprising to see tighter money (which we now have since the latest QE program ended) push prices down. But almost nobody was expecting oil prices to fall so hard and so fast. It is likely a combination of decreasing global demand and either increasing supplies or expected future increases in supply. The decreasing global demand is easy to pinpoint because Japan and much of Western Europe are in recession or worse. And the Chinese economy is slowing (not counting the Chinese stock market). The supply of oil has been increasing, which many people did not predict a few short years ago. We have been hearing that the world is running out of oil for many decades now. Perhaps the oil that is cheap and easy to get out of the ground is running out, but new technologies are making new supplies possible, particularly with the shale oil boom. Shale oil is more expensive to extract, but it is there, and it is real. There is not an equivalent of shale oil for gold. If the gold price goes up to $2,000 per ounce, it’s not as if there are all of these gold mines just waiting to be dug up. In this sense, the idea of peak gold is more intriguing than peak oil, at least for investors. We know there is a lot more oil to be used at some price. We don’t really know the same for gold. Join Wealth Daily today for FREE. We''ll keep you on top of all the hottest investment ideas before they hit Wall Street. Become a member today, and get our latest free report: "Gold Outlook 2019: How to Profit from Gold's Bull Run"
It contains full details on something incredibly important that''s unfolding and affecting how gold is classified as an investment.. There is no such thing as peak U.S. dollars. On this, Bernanke told the truth. The Fed can create new money out of thin air at any time. Its only limit is its reputation and that of the dollar. The Fed doesn’t want to go into hyperinflation because this would destroy the dollar and the Fed officials' own power (along with their pensions that are denominated in dollars). But other than the limits of hyperinflation, the Fed really can and will create as much money as it thinks is necessary, whether it is to bail out banks or fund the deficits Congress runs. As mentioned before, as the supply of dollars increases, commodity prices tend to increase as well. This can be offset by increasing demand for dollars, but that cannot be sustained long term. The virtually unlimited ability of the Fed to create money out of thin air is still the most compelling reason to own gold. Owning gold is your protection against a bad fiat currency. The idea of peak gold is a secondary reason to own gold. The U.S. dollar has had a strong year. It is up against most of the major currencies of the world. Of course, it is not great, but the other fiat currencies are junk. The Japanese yen in particular is now a terrible currency to own, and the euro isn’t much better. Despite the rise in the U.S. dollar, the gold price has held up reasonably well. Imagine the run gold could have if the U.S. dollar started going down again in relation to some of the other currencies. Is there peak gold that will become evident in the years to come? We can’t really answer that. But we do know there is no peak dollar, as the Fed can essentially create as many as it wants. There is also no such thing as peak yen or peak yuan or peak euro. Investors worldwide are going to discover that they can’t trust the money that is issued by their own governments and central banks. For this reason, we should expect the demand for gold to go higher in the coming years. When all of the major countries in the world are debasing their currencies at a staggering rate, people will be left with few alternatives. We should not even be surprised if the Fed goes back into money creation mode if the stock market goes down enough or the U.S. economy falls back into recession. Do you really think Janet Yellen and the Fed are going to sit on their hands if the U.S. economy shows significant signs of weakening? You should bet on more central bank inflation with gold in your portfolio. If this idea of peak gold is true and new supplies start to diminish, then it will just be icing on the cake as more people demand gold. It may be time for you to get a second passport. Here are some good reasons to do it and how to complete the process. If you had to own three commodities in 2015, these would be the ones. If China falls, will it dump all its U.S. government debt?